MAXWELL K BAUM // DAEKWON PARK // ARC 505 THESIS PREP. Sacred space is no longer the realm of the religious. “People develop highly individualized, institutionally unsupported ways to worship. They are more pious than they realize”. Yet this worship is no longer restricted to merely the worship of the divine. Architecture of worship, be it from any great religion, are all “designed for the same purpose of elevating the soul”. Why can other architecture not achieve the same result? both introspective reflection and extrospective contemplation, and proposes architecture for the experiencing of the sacred. Architecture can serve as the platform for the transcendental experience. This can be achieved through a thorough understanding of criteria this thesis has identified as constituents in creating sacred space. The concept of Le Corbusier’s “L’espace Indicible,” the ideas of phenomenology and atmosphere, and the concept of a “lived space.” Ultimately this project will make sacred architecture and experience out of a normal, mundane, and profane program and elevate the users experience to that of a transcendental one. THE CONCEPT OF SACRED Simply, sacred architecture creates a space that allows for the user or users to engage in transcendental thought, practice, or action. Conventionally, these spaces are simply churches, or mosques, or temples, or any other house of worship. Additionally they can equally be seen as spiritual places, such as a yoga studio as an example. Yet, these are restrictive and conventional. Why can other programs not hope to achieve the same effect on their users? Can a “profane” or “normal” program not serve the same function to its inhabitants? Contemporary sacred architecture instills emotion and thought. It requires of its users an involvement and inclusion in daily practice or ritual. In the opposite sense, sacred architecture emits or transmits emotion to its users: it, in a way, is in direct dialogue with one or with every user. It should speak to them, yet in different, personal ways. It can be with different intensity, from a shout to a whisper. Architecture can inflect mood, control a situation, and curate experience. It can create atmospheres that are supporting, uplifting, or inspiring, as well as spaces that are suffocating, compressing, or somber. Sacred architecture seeks to benefit its users. This does not imply that its characteristics are merely gentle ones: it too should seek to provide space that humbles its occupants. The main function for sacred architecture, beyond enclosing or defining space, is to elevate its users mindset, spirit, fervor, etc. It equally serves and humbles, always in some form of dynamic relationship with its occupants. Not every space within a sacred space is literally sacred space. This seems counterintuitive, yet is founded on a concept of levels of sacredness within a project: the altar of the church is far more sacred than the narthex or the nave. Some spaces can become more sacred with more people in them, or it is equally possible for the opposite transition into more profane. A space for one can hold the entire weight of the world within its walls, while a large one can simply be homogeneous nothing. One cannot appreciate the extremes or the subtleties without comparison or the â&#x20AC;&#x153;otherâ&#x20AC;?. Levels of sacred architecture have the potential to manifest themselves in essentially any program, so long as it is designed in a way that allows for it to occur. Proper design, form, material, light, texture, smell, taste, and emotion: all need a place in architecture, and all act towards creating truly powerful space. Not all architecture can afford to expend effort or money on all aspects like these, but all must strive to achieve the affect. Sacred architecture is a luxury, but it is a right. fig. 01: The Hall of Bulls at Lascaux, 16,000-14,000 B.C.E. and curated experience to engage with the power and collective strength that they provided. They were magnificently built, truly feats of incredible ability spurred by divine inspiration. They usually had megalithic qualities to them and were able to support use by many people. space to withdraw partially from society. Programs such as libraries, museums, and coffee shops may constitute this section. Finally the fourth and almost quasi-sacred space is the vaguely titled individual space. It is in a way the own personal world: the home, a workspace, the studio. A deeply personal space, everything is fine tuned to the users needs. The user is as much a part of the space as the space is a part of the user. As the evolution of the sacred expands to encompass more definitions, on the contrary, the number of users for the spaces may arguably get smaller. It still seems as though the more commonplace definitions of the sacred are those with the most body of users. This may likely be because they are easier to define and have more strict delineations between the sacred and the profane: in a way making them more easily digestible and prescribe-able: a visitor knows what to expect and therefore they are more comfortable and accepting. They are less willing to be an individual and risk the failure of achieving a sense of the individual, so the comfort of the norm is more appealing and widespread: it is accepted. What has been held sacred and what is sacred today contain both simultaneities and contradictions. Through architecture and the built environment, one can observe and understand what society holds as sacred. As evidence, the erecting of architecture serves to stand as monument for the values of society. Not all are bad, but some have been devalued and in other cases over valued. All is relative but is a reflection of the society in which they exist. Faith Congregation – The traditional congregation space. A large space for the flowing of people, conversation, and oration. Traditionally religious, the space can now manifest in other congregational spaces, such as auditoriums or theaters. This space usually comes with connotations of a megalithic or grand quality by virtue of enclosed space and scale. An emphasis on internal thought and human interconnection is placed on these spaces. Fanatic Congregation – The new societal congregational space: the sports arena. As devoutly followed as a faith, the religiousness of professional sports has come as a reckoning force. With this, naturally, has come the creeping inclination of capitalism. The focus of these spaces is to produce and consume: images, values, and capital. The act of consumption by the public mass is the focus of this type of space. The Picturesque Monolith – An architecture that humbles the human figure. The picturesque monolith serves as a point of pilgrimage within a landscape. It raises above the scope of the city and the human and serves as a bastion of gathering. It connects like-minded pilgrims in a space that provides for the furthering of their collective agenda. The Capitalist Monolith – The capitalist monolith is a space that controls the human figure. Imbued with money, power, and social influence, the capitalist monolith commands a fanatical following of brand and identity. “Followers” perform pseudo-religious pilgrimages to the capitalist monolith upon release of its latest “sermon” in the form of product releases. Intellectual Exploration – The simple creation of the realm of an intellectual conversation. A landscape, a city scape, either can serve as the backdrop for an exchange of human intellect. A momentary respite from day to day life and the opportunity for contemplation and thought: a place for critical thought. Visual Consumption – The television and its accompanying room provide a space for the consumption of images and ideas. Non-critical, low in substance, and capitalist in nature, a space fit for simple visual consumption is the antithesis of the space for intellectual exploration. Spatial Experience – Simply the deviation from the norm and the generic. The installation of a unique experiential space, through volume, form, material, light, etc. can provide symbolism to the space, elevating it to a function beyond just a space. The creation of a unique volume allows a hierarchy of space to be created within a larger framework. Architecture as designed and as “architecture”. Generic (Economic) Construction – The current state of architectural construction and design. Dehumanizing, uninspiring and generic the repetitive space and motifs create a leveled building with no hierarchy. Architecture a seen through economy of effort and as “building”. Personal World – Carving out a moment in life for the removal from the societal machine. Individual exploration of knowledge, passion, or interest can create a personal space that allows the creator to experience a transcendental experience. In this example, the personal world is created in the act of reading literature, where the user becomes momentarily removed and into a world of their mind: a sacred action. Digital World – Individual time and space seem to no longer exist. The world is now almost inescapably connected and invasive. Literature is falling out of fashion and the digital world is growing evermore pervasive and powerful. Obviously this comes with many benefits but some overlooked detriments as well. There is a lack of ability to be disconnected and self reflective: true alone time. In Praise of Shadows (Tanizaki) – Author J. Tanizaki spoke about the balance between darkness and light, and the characteristics and forgotten beauty of darkness and shade. The use of shadow for comparison heightens the effect of the light and vis-à-vis: the existence of one heightens, through relation, the other. The shard of light invites curiosity and mystery: it encourages exploration and viewing. Free from Shadows – The proliferation of light allows for a light and transparent space. By opening the space to light, it also makes it open to the views towards the outside. But in this opening up, the view becomes less emphasized because it is readily available and always present: it loses its significance and is quickly forgotten into the background. Reflecting Space – Individual space for the intended purpose of providing self reflection. The presence of the elements creates a naturalistic setting for the contemplative mood. Narcissistic Reflection – Today’s only truly individual space: the bathroom. Even this is proliferated by the need to narcissistically reflect on ones visual identity. The shower can serve as the final frontier of truly individual space, being actually disconnected from the social grid, and provide the user with a contemplative instance. The Studio – A romantic space of human creation. Art as the embodiment of human expression and spirit, the art studio is a temple in itself. Ritual, devotion and toil are common in the creation of ones art and personal reward and critique are present. Isolation can provide a safe space for the adventurous exploration of ones ideals and desires for creation and expression. The space is purpose built and can be tailored to preference. The Coffee Shop Studio – A shift away from a romantic or picturesque image of creation, the reality is much more collaborative, fluid and urban. The surrounding of activity can inspire an equal drive to create and be inspired. The space is inherently not programmed for all the possible uses and is not purpose-designed. The Mausoleum – The mausoleum serves as the sacred space to the dead. An atmosphere of quiet reflection and respect, the space demands a certain behavior. The space of the dead marks the embarking into another world and with it a sacred experience. The Roadside Shrine – The creation of a small edifice and a personal connection to it. It remains ambiguous and non-intrusive into societal perception and is passed by the masses without much thought. A unique instance of polarizing meaning depending on viewer, a large amount of meaning, or simply a passing thought. Elemental Skyscape – The skyscape serves as a direct connection to nature and an invitation to the elements. The power to impact a space with a simple oculus dates all the way back to the Pantheon. It is almost in human nature to be fascinated by it. Natural light cascades into the space and vision is funneled up. This momentarily allows the user to disconnect from their surrounds. Florescent Skyscape – A space that substitutes natural light for artificial light. The artificial light cannot compare to the symbolism and resonance of the natural. Executed correctly, the space generally achieves usability but does not elevate the space in a meaningful way. Private Workspace – A realm of personal control, ritual, and advancement, the private workspace represents a comfortableness and personally sacred space. Full control and “fit” within the space creates a temple like atmosphere and implies an almost monastic devotion to the furthering of ones pursuits. Consuming the Cubicle – An impersonal, repetitive, generic workspace that is not tailored to the user. The individual becomes part of a collective whole and de-sanctifies the space and practice. The Natural Vista – The act of architecture allowing man to rise above the natural world. From this point, man surveys the natural landscape and situates himself within a large point of view. Both humbling and inspirational, the natural vista serves as a point of departure for the sacred experience. Vista to the Accomplishments of Man – Equally important to the natural vista is the opposite: the vista to the accomplishments of man. This view looks upon the city or constructs of man and allows the viewer again to view all that which is human. Personal Shrine – A personal object that resonates symbolically with ones inclinations, feelings, or opinions. A place where personal meaning is strong and individual resonance occurs, through conventional or unconventional manifestation. An edifice or object that is created for a symbolic reason. Impromptu Shrine – The instant manifestation of symbolic sacred as a result of tragedy. Shrines appear overnight at street corners, chain-link fences, steps, and other nondescript locations. Their spontaneous happening does not belittle their deep, emotional sacred value. Selective Light – This image highlights an interesting symbolic charge that the simple control of light can bring. Specific lighting symbolically highlights the individual figure. Connotations of an alternate experience or sensation are applied to that figure. Additionally, the light interacts with the scale of the space and creates a humbling, transcendental atmosphere. Generalized Light – Removal of the light ultimately alters the space in every way. The removal of the apertures alters the space in a generic way but what ultimately happens is a shift in sensation for the figures and the atmosphere of the space. Suddenly there is a shift from a transcendental platform to a space of sterile alienation. Mystery, Complexity, Curiosity – The desire to create an architecture, beyond face value, that was intellectually complex and fulfilling permeated the historical masters and forerunners of the architectural discourse. It inspires user experience and encourages a deeper understanding and experiencing of an architectural space. An architecture that inherently resonates with the human scale: space that can be universally impactful. Historically these have been the sacred spaces: religious spaces. Literal Transparency – An architecture with no contradictions or complexities, extreme literal transparency has permeated architectural design at all levels of value. Easily digestible, one-off architecture provides the public with iconic architecture that acts as pure symbolism and iconography. No complexity or depth results in an architecture that drives complacency and boredom. Processional Enlightenment – The act of sequence, procession, and pilgrimage is one that is central to the idea of sacred. Religiously, pilgrimage has shown to be a literal and allegorical representation of growth and sequence through a space and through life or experience. Stairway to Consumption – Today’s sequence has been simplified and streamlined. Its purpose now is capital driven, allowing a pilgrimage or procession through stores, images, and consumption. Shopping malls provide a sequential procession through a host of capitalist enterprises and the meaning and personal sacrifice or growth is lost. The Individual – Sacred to the individual. The individual process, the strife, the growth, the success, the failure. An experience that’s ultimately intrinsic to the human condition and ultimate in priority. The Collective – Sacred to the collective. A collective collaboration of the socially accepted sacred. The sharing of a collective goal and the collaborative effort to bring that value to fruition. Equally important and necessary in society. Natural Sanctuary – A simple case of grounding, that allows for a re-orientation and removal. A small intimate sanctuary that can serve as a temporary release from ones condition. Instances of this appear historically in the form of courtyards and site location. Artificial Sanctuary – Due to the lack of this true natural connection in today’s reality, an artificial sanctuary and connection has been forged. Superficial connections and relation to nature appear in contemporary construction in effort to bring the natural back into the built environment. can be. It just simply is the first thing that comes to mind when questioned about ones perception of what sacred can be or is. The individual sacred is a construct of today’s widening scope of inclusivity. Yet this is not a bad thing, as in to accept for the sake of accepting everything. People have become, or rather maintained, their spirituality and devotion but allocated it to avenues aside from traditionally religious ones. With this in mind, “normal” spaces begin to hold much more power and allow them to better serve their users individual needs. Due to the personal nature of this interaction, a generalized aesthetic is hard to decree. But aspects of design may have shared qualities. Careful attention to form, material, atmosphere, human scale and proportion are key to creating a space that is equally reactive and relative to its occupant or occupants. Additionally, the individual space can often become a sort of lived space. It becomes customizable and unique. It does not need to be stark, clean and empty, but can be full of character, personal touch and clutter. It can have a disorganized beauty in that everything is exactly where it needs to be, not necessarily out of site: organized chaos. It is all the product of the one who uses it. ATMOSPHERE OF THE SACRED “The passage of time; light, shadow, and transparency; color phenomenon, texture, material and detail all participate in the complete experience of architecture ... Only architecture can simultaneously awaken all the senses - all the complexities of perception” -- Steven Holl Building on the concept of phenomenological and atmospheric architecture (Holl, Zumthor, Pallasmaa), sacred architecture should strive to connect to its users on an emotional level. The creation of an atmosphere within a project is a powerful tool: it imbues it with a soul. By careful choice of material, for texture, temperature, reverberation, etc., a project can begin to take on symbolic and atmospheric meaning. A cold, smooth concrete, a heavy, rough stone, warm, grained wood, or a slice of ice glass plane. These materials, in a way, transcend simple materials. They control the space; they are the space, not simply constructs of it. PROJECT This project will be a non-religious sacred space. A place for worship. A place for ritual. A place for devotion. A place for the individual. And a place for the collective. This project will explore the concept of sacredness by creating architecture to house an educational institution. The program allows for ritual and routine, a strong sense of collective an individual space, and the opportunity to engage with multiple communities. Living space, large public space, and classrooms are some of the programmatic needs. Additionally, the idea set forth by Louis Kahn about a building being, â&#x20AC;&#x153;a world within a world,â&#x20AC;? will be considered in ultimate attention. This project will construct a unique and alternate world within the confines of its space, fit with an atmospheric, symbolic, and humanistic characteristic. It wishes to be both introspective and extrospective, just as the individuals and communities that use it are. Its achievements and principles are an echo of those that are to be obtained by its users. This project aims to impact the individual as well as the collective. This must be done by contrasting, not rejecting, one with the other. It features space for both the collective and the individual: it provides solitude as well as community. A balance of needs. The profanely sacred, and the ineffable mundane. SITE The site chosen for this intervention is Florence, Italy. The city features a rich history of sacred architecture, but all from a religious standpoint. To contrast this, in building in this site, the project will cast all of the sacred city as the profane, and within its walls, define a new sacred. Two sites have been selected, one across the Arno just east of the Ponte alle Grazie and the other within the city fabric just north of the Mercato Centrale on the site of an abandoned monastery. The River Site (01) provides a monastery like â&#x20AC;&#x153;outside-nessâ&#x20AC;? and more flexibility of design. The site itself will be on an L shaped site and the adjacent unused garden space on the bank of the river. Similar to ancient monasteries, it is constructed on the fringe of the city, perhaps to spur more coming development as a community develops around it. The City Site (02) is located well within the city fabric. The site was once a monastery but now lies abandoned and boarded up. Thickly woven into the fabric of the city, there are multiple exterior forces to be dealt with, as well as the existing structure and organization of the site to consider. THESIS PROJECT - BRIDGE II This project will be a non-religious sacred space. A place for worship. A place for ritual. A place for devotion. A place for the individual. And a place for the collective. This project is situated across the Arno in Florence, Italy and takes the form of an inhabitable pedestrian bridge, public gallery, and fine arts institute. Bridge II hopes to explore the tension between individual and collective and to understand and test the relationship as one that requires and fosters both: as the individual needs the collective to function as does the opposite. This thesis aims to explore the notion of sacred in the attempt to design a contemporary sacred space using a non-sacred program. Bridge II creates a direct connection between the biblioteca nazionale and the opposite side of the Arno. This ultimately acts to create a larger connection within the city from Santa Croce to the Piazzale Michelangelo. Bridge II’s older sibling is Bridge I – the Ponte Vecchio. The Ponte Vecchio also acts as an artifact in between two monuments – the Uffizi and palazzo pitti. The three of them contribute to experiencing the city of Florence in the same way Bridge II hopes to achieve. Florence is a highly curated experience of a city. Visitors ritually pilgrimage to the same monuments and experiences – climb the duomo, visit the fort, sit in the piazzas. Its ritualized, preserved, and experienced almost to the point of a Disneyland-esque park and is held sacred as a city because of it. In terms of design, Bridge II seeks to achieve the aesthetic and effect of the stereotomic through the means of a contemporary tectonic system. This ultimately situates the project at the crossroads of atmosphere and phenomenology and the formal tectonic language presenting a sensitivity towards materiality, light, texture, with a strict adherence to formal design. Organizationally, the design draws from the church and monastery layout and typology, reprogramming the elements into secular translations. the project design recognizes the irony behind the designing of a sacred space and the idea of sacred. This allowed for the project to have an excuse to really explore architecture, space, and representation and presented the opportunity to really design a building without limits. This project recognizes this irony and accepts it. 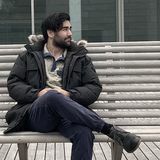 The project hopes to emphasize its literal connecting nature acting as an artery for the city and its experiences. Internally, the spaces are created to be highly ritualized, designating programs and functions along strict sequential processions using a hyper constructed monastic framework as precedent. Externally, the experience is curated through the framing of views towards Florence and its monuments, becoming a platform for the viewing of the city. The project aims to bridge the gap between formal design tradition and the experiential and phenomenological aspects of humanistic design. It acts as a ritualized formalist skeleton with a sacred, experiential skin. WORKS CITED ACHILLES, ROLF. "BAROQUE MONASTIC LIBRARY ARCHITECTURE." THE JOURNAL OF LIBRARY HISTORY 11.3 (1976): 249-55. JSTOR [JSTOR]. WEB. 6 SEPT. 2016. ANDERSON, RICHARD. "TIRED OF MEANING." LOG 7 (2006): 11-13. JSTOR. WEB. ARNHEIM, RUDOLF. THE DYNAMICS OF ARCHITECTURAL FORM. BERKELEY: U OF CALI FORNIA, 1977. PRINT. ASHRAF, KAZI KHALEED. "TAKING PLACE: LANDSCAPE IN THE ARCHITECTURE OF LOUIS KAHN." JOURNAL OF ARCHITECTURAL EDUCATION (1984-) 61.2 (2007): 48-58. JSTOR. WEB. AURELI, PIER VITTORIO. THE POSSIBILITY OF AN ABSOLUTE ARCHITECTURE. CAMBRIDGE, MA: MIT, 2011. PRINT. BACHELARD, GASTON, M. JOLAS, AND JOHN R. STILGOE. THE POETICS OF SPACE. N.P. : N.P., N.D. PRINT. BERMÃ&#x161;DEZ, JULIO CESAR. TRANSCENDING ARCHITECTURE: CONTEMPORARY VIEWS ON SACRED SPACE. N.P. : N.P., N.D. PRINT. BINET, HELENE, AND DOMINIK GIGLER. DETAIL OF THE ATELIER'S WOODEN FACADE AND CONCRETE FACADE. DIGITAL IMAGE. METALOCUS. N.P., N.D. WEB. BITTERMAN, JERREMY. CLYYFORD STILL ART MUSEUM. DIGITAL IMAGE. DAILYTONIC. N.P., N.D. WEB. BLAU, EVE. "CURATING ARCHITECTURE WITH ARCHITECTURE." LOG 20 (2010): 18-28. JSTOR. WEB. BLOOMER, KENT C., AND CHARLES WILLARD MOORE. BODY, MEMORY, AND ARCHITECTURE. NEW HAVEN: YALE UP, 1977. PRINT. BORYS, ANN MARIE. "LUME DI LUME: A THEORY OF LIGHT AND ITS EFFECTS." JOURNAL OF ARCHITECTURAL EDUCATION 57.4 (2004): 3-9. JSTOR. WEB. BRION CEMETARY. DIGITAL IMAGE. ARCHITIZER. N.P., N.D. WEB. BRITTON, KARLA. CONSTRUCTING THE INEFFABLE: CONTEMPORARY SACRED ARCHITECTURE. NEW HAVEN, CT: YALE SCHOOL OF ARCHITECTURE, 2010. PRINT. BROWN, AND BROWN. MATERIAL PALETTE - PETER ZUMTHOR. DIGITAL IMAGE. BROWN + BROWN ARCHITECTS. N.P., 10 NOV. 2010. WEB. 6 SEPT. 2016. CADWELL, MICHAEL. "TWO STONES." LOG 12 (2008): 13-19. JSTOR. WEB. CONTEXT. UNITITLED. DIGITAL IMAGE. CONTEXT. N.P., 18 AUG. 2016. WEB. 05 SEPT. 2016.DAY, KATIE. "THE CONSTRUCTION OF SACRED SPACE IN THE URBAN ECOLOGY." CROSSCURRENTS 58.3 (2008): 426-40. JSTOR [JSTOR]. WEB. 6 SEPT. 2016. DAY, KATIE. "THE CONSTRUCTION OF SACRED SPACE IN THE URBAN ECOLOGY." CROSSCURRENTS 58.3 (2008): 426-40. JSTOR. WEB. ELIADE, MIRCEA, AND WILLARD R. TRASK. THE SACRED AND THE PROFANE: THE NATURE OF RELIGION. NEW YORK: HARCOURT, BRACE & WORLD, 1959. PRINT. EVANS, ILLTUD. "HEARD AND SEEN: LE CORBUSIER'S MONASTERY AT WORK." BLACKFRIARS 45.528 (1964): 274-75. JSTOR. WEB. FOSTER, HAL. "NEW MONUMENTALITY: ARCHITECTURE AND PUBLIC SPACE." PERSPECTA 42 (2010): 135-39. JSTOR. WEB. HALL OF BULLS. DIGITAL IMAGE. STUDYBLUE. N.P., N.D. WEB. HILDNER, JEF7REY. DAEDALUS 9: THE ARCHITECT PAINTER [IMPROV 1.0]. N.P. : N.P., 2010. PRINT. HOLL, STEVEN, JUHANI PALLASMAA, AND ALBERTO PEREZ GOMEZ. QUESTIONS OF PERCEPTION: PHENOMENOLOGY OF ARCHITECTURE. SAN FRANCISCO, CA: WILLIAM STOUT, 2006. PRINT. IRVINE, R. D. G. "THE ARCHITECTURE OF STABILITY: MONASTERIES AND THE IMPORTANCE OF PLACE IN A WORLD OF NON-PLACES." ETNOFOOR 23.1 (2011): 29-49. JSTOR. WEB. KAHERA, AKEL ISMAIL. "GARDENS OF THE RIGHTEOUS: SACRED SPACE IN JUDAISM, CHRISTIANITY AND ISLAM." CROSSCURRENTS 52.3 (2002): 328-41. JSTOR [JSTOR]. WEB. 6 SEPT. 2016. KAHN, LOUIS. "ARCHITECTURE IS THE THOUGHTFUL MAKING OF SPACES." PERSPECTA 4 (1957): 2-3.JSTOR. WEB. KAHN, LOUIS. "LOUIS KAHN ON LEARNING." DESIGN QUARTERLY 86/87 (1972): 41. JSTOR. WEB. KAHN, LOUIS I., AND DUNG NGO. LOUIS I. KAHN: CONVERSATIONS WITH STUDENTS. HOUSTON, TX: ARCHITECTURE AT RICE PUBLICATIONS, 1998. PRINT. KEENEY, GAVIN. "OBSERVATIONS ON "UNSPEAKABLE SPACE"" LOG 18 (2010): 78. JSTOR. WEB. KIECKHEFER, RICHARD. THEOLOGY IN STONE: CHURCH ARCHITECTURE FROM BYZANTIUM TO BERKELEY. NEW YORK: OXFORD UP, 2004. PRINT. KLIEVER, LONNIE D. "STORY AND SPACE: THE FORGOTTEN DIMENSION." JOURNAL OF THE AMERICAN ACADEMY OF RELIGION XLV.2 (1977): 221. WEB. KOOLHAAS, REM. DELIRIOUS NEW YORK. NEW YORK: MONACELLI, 1994. PRINT. LANG, UWE MICHEAL. "1. IDEAS OF THE SACRED IN CONTEMPORARY ARCHITECTURE." 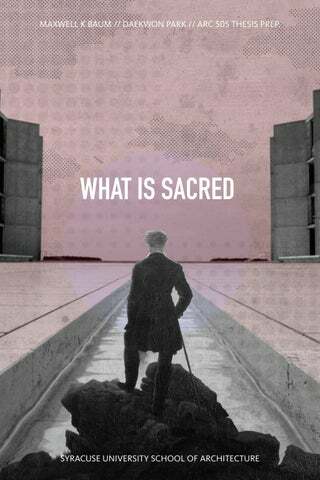 PROJECT MUSE - WHAT MAKES ARCHITECTURE "SACRED"? LOGOS, 2014. WEB. 18 DEC. 2016. LEATHERBARROW, DAVID. "WORKING MATERIALS: OR, ARCHITECTURE SHOWS WHAT MATERIALS DO. "BUILDING MATERIAL 17 (2007): 37-47. JSTOR. WEB. LI, HONG, AND DONGHUI HAN. "WHAT IS THE INEFFABLE EXACTLY? AN EXTENSIVE READING OF WITTGENSTEIN'S TRACTUS LOGICO-PHILOSHICUS." FRONTIERS OF PHILOSOPHY IN CHINA 2.3 (2007): 402-11. JSTOR. WEB. LOOS, STEFFI. VISITORS WALK OVER THE HOLOCAUST MEMORIAL DURING WARM AND SUNNY WEATHER IN BERLIN. DIGITAL IMAGE. HUFFINGTONPOST. N.P., N.D. WEB. LOUIS KAHN DHAKA. DIGITAL IMAGE. THE ARCHITECT'S JOURNAL. N.P., N.D. WEB. MERRIFIELD, ANDREW. "PLACE AND SPACE: A LEFEBVRIAN RECONCILIATION." TRANSACTIONS OF THE INSTITUTE OF BRITISH GEOGRAPHERS 18.4 (1993): 516. WEB. MIZIA, MALGORZATA. "ARCHITECTURE AS AN ART OF UNDERSTANDING." THE POLISH REVIEW 59.4 (2014): 81-92. JSTOR. WEB. MORAVANSKY, AKOS. "MY BLUE HEAVEN: THE ARCHITECTURE OF ATMOSPHERES." AA FILES 61 (2010): 18-22. JSTOR. WEB. MURRAY, PETER. THE ARCHITECTURE OF THE ITALIAN RENAISSANCE. NEW YORK: SCHOCKEN, 1964. PRINT. NEW SACRISTY. DIGITAL IMAGE. STUDYBLUE. N.P., N.D. WEB. PALLASMAA, JUHANI. THE EYES OF THE SKIN: ARCHITECTURE AND THE SENSES. CHICHESTER: WILEY-ACADEMY, 2005. PRINT. PALLISTER, JAMES. SACRED SPACES: CONTEMPORARY RELIGIOUS ARCHITECTURE. LONDON: PHAIDON LIMITED, 2015. PRINT. PEPONIS, JOHN. "THE ARCHITECTURAL CONFIGURATION OF LYRIC FORM AT LA TOURETTE." EKISTICS60.362/363 (1993): 237-52. JSTOR. WEB. "PETER ZUMTHOR: SEVEN PERSONAL OBSERVATIONS ON PRESENCE IN ARCHITECTURE." ARCHDAILY. N.P., 02 DEC. 2013. WEB. 05 SEPT. 2016. REED, PETER. "KAHN'S MODERN MONUMENT." MOMA 3.4 (2000): 10-13. JSTOR. WEB. ROBINSON, JENNIFER. "ON BEING MOVED BY ARCHITECTURE." HE JOURNAL OF AESTHETICS AND ART CRITICISM - WILEY ONLINE LIBRARY. WILEY, 2012. WEB. 18 DEC. 2016. SAN CARLO ALLE QUATTRO FONTANE, BORROMINI. DIGITAL IMAGE. PINTEREST. N.P., N.D. WEB. SCHAPER, DONNA. "SACRED SPACES." CROSSCURRENTS 50.1/2 (2000): 221-25. JSTOR [JSTOR]. WEB. 6 SEPT. 2016. SCHWARZER, MITCHELL. "THE EXTREMES OF SPATIAL EXPERIENCE." AA FILES 57 (2008): 67-73. JSTOR. WEB. SERENYI, PETER. "LE CORBUSIER, FOURIER, AND THE MONASTERY OF EMA." THE ART BULLETIN 49.4 (1967): 277-86. JSTOR. WEB. SHELDRAKE, P. "PLACING THE SACRED: TRANSCENDENCE AND THE CITY." LITERATURE AND THEOLOGY 21.3 (2007): 243-58. JSTOR [JSTOR]. WEB. 6 SEPT. 2016. SHINER, LARRY E. "SACRED SPACE, PROFANE SPACE, HUMAN SPACE." J AM ACAD RELIG JOURNAL OF THE AMERICAN ACADEMY OF RELIGION XL.4 (1972): 425-36. JSTOR [JSTOR]. WEB. SLOTERDIJK, PETER, AND DANIELA FABRICIUS. "CELL BLOCK, EGOSPHERES, SELF-CONTAINER." LOG 10 (2007): 89-108. JSTOR. WEB. STAMP, GAVIN. "SACRED ARCHITECTURE IN A SECULAR CENTURY." TWENTIETH CENTURY ARCHITECTURE 3 (1998): 8-16. JSTOR. WEB. TAN, LI LIAN. "CONTEMPLATION IN AN URBAN LANDSCAPE: A CONTEMPORARY CISTERCIAN MONASTERY. "THRESHOLDS 20 (2000): 38-41. JSTOR. WEB. TREIB, MARC. "TO END A CONTINENT: THE COURTYARD OF THE SALK INSTITUTE." JOURNAL OF THE SOCIETY OF ARCHITECTURAL HISTORIANS 65.3 (2006): 402-27. JSTOR. WEB. TANIZAKI, JUN'ICHIRŌ. IN PRAISE OF SHADOWS. NEW HAVEN, CT: LEETE'S ISLAND, 1977. PRINT. UNTITLED. DIGITAL IMAGE. ATOMORFEN. N.P., N.D. WEB. VENTURI, ROBERT. COMPLEXITY AND CONTRADICTION IN ARCHITECTURE. NEW YORK: MUSEUM OF MODERN ART, 2011. PRINT. VIDLER, ANTHONY. "UP AGAINST THE WALL: COLIN ROWE AT LA TOURETTE." LOG 24 (2012): 7-17. JSTOR. WEB. WEIGHTMAN, BARBARA A. "SACRED LANDSCAPES AND THE PHENOMENON OF LIGHT." GEOGRAPHICAL REVIEW 86.1 (1996): 59. JSTOR. WEB. ZAMORANO, MONTSE. LA TOURETTE. DIGITAL IMAGE. ARCHDAILY. N.P., N.D. WEB. ZUMTHOR, PETER, AND JUHANI PALLASMAA. OASE 91: BUILDING ATMOSPHERE: MATERIAL, DETAIL AND ATMOSPHERE IN ARCHITECTURAL PRACTICE. N.P. : NAI010, N.D. PRINT. ZUMTHOR, PETER. ATMOSPHERES: ARCHITECTURAL ENVIRONMENTS, SURROUNDING OBJECTS. BASEL: BIRKHÄUSER, 2006. PRINT. ZUMTHOR, PETER, MAUREEN OBERLI-TURNER, AND CATHERINE SCHELBERT. THINKING ARCHITECTURE. BASEL: BIRKHÄUSER, 2006. PRINT.